All the tools you need to engage your supporters with online actions, communicate at scale and grow your organization. Communicate and Engage at Scale. Get a message to everyone or to a targeted list built from nearly any field on your database with just a few clicks. Track the success of your emails, petitions, online engagement. Advanced reporting lets you easily see which emails are triggering actions from your supporters. Capitalize on high-interest events quickly. Create a signup landing page or a petitions in a few clicks, then broadcast them out and instantly to begin galvanizing support and making an impact. 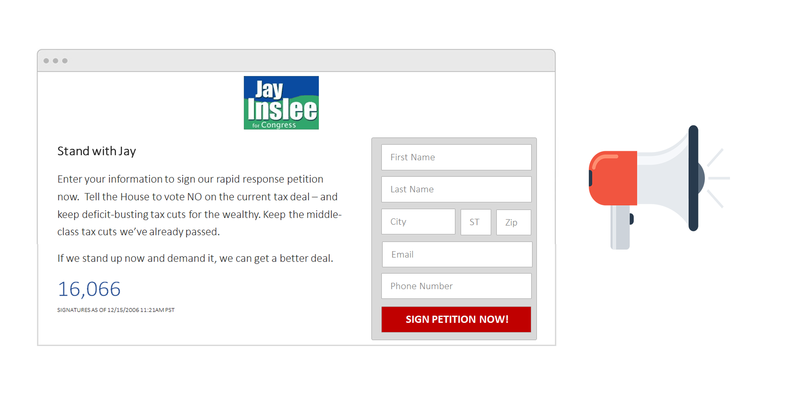 Quickly create action pages to solicit volunteers, build endorsement lists, generate pledges, and more. Collect any information you want and measure responses in real-time.